I have been making amulets which address our deepest longings. Although I do not believe that my art works magic, I do think there is some magic worked by hope and prayer. My amulets offer a ray of hope, joy, color. 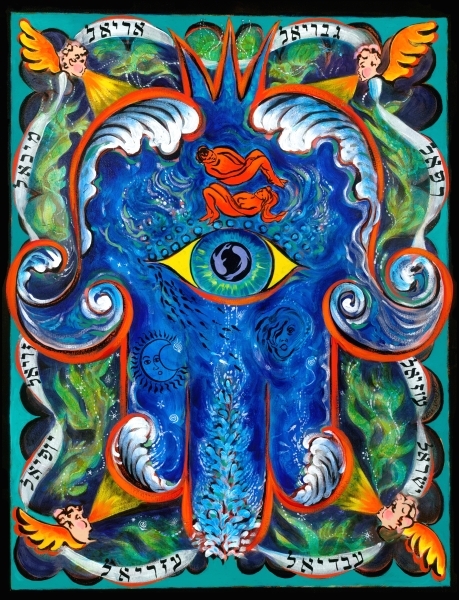 All of them have a hamsa, which is an ancient Middle Eastern/ North African amulet against the evil eye. I will be showing them at Moriah Congregation Judaica and Jewelry Fair on March 6-8, 2010, in Deerfield, Illinois. This is a beautiful show that includes Israeli and international artists, and I am proud to be part of it. For the first time, I will be offering fine-art prints and posters of my work, in an effort to make it more affordable. I have finally enbraced digital printing, and I can’t believe how beautiful the prints are! The show hours are: Saturday night, March 6, 8-11 p.m.; Sunday, March 7, 10 a.m. to 5 p.m.; Monday, March 8, 9 a.m. to 1 p.m. Here are my new amulets: Earth, Fire, Water, Air. Please let me get this job! Please let my check not bounce! Please help (me/someone I love) heal! Please help me get through this recession! Please help me find peace! Please help me find my way out of this loneliness! Please let my spirit soar! My amulet paintings give form to these longings.